Is Using Manuka Honey For MRSA Infections A Legitimate, Effective Treatment? The title of this post poses a question and the answer is…absolutely. MRSA, although resistant to various antibiotics, is sensitive to many natural compounds that have antibacterial and antibiotic properties such as many essential oils, Olive Leaf Extract, Garlic, and importantly, Manuka Honey. As such, the use of Manuka Honey for MRSA infections is not only a legitimate treatment but it is also a highly effective one. Why is Manuka Honey so effective against MRSA? 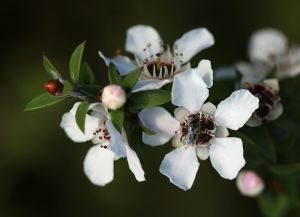 The Manuka plant has several medicinal properties including antibacterial properties. These properties can also be found in the honey produced from Manuka. Manuka Honey has antibacterial properties (and MRSA is a bacteria) and the key ingredient is the Manuka. Manuka Honey applied topically to wounds also promotes rapid healing. These factors make it not only a highly sought after natural treatment for various illnesses and infections, but also highly effective against MRSA. What is so special about Manuka Honey? The key ingredient in Manuka honey that makes it so effective against bacterial infections (including MRSA) is the Manuka. The potency of the Manuka in the honey is critical and as such a measurement was developed to put a value on the concentration of the Manuka in the honey. This measurement is called the Unique Manuka Factor or UMF. The higher the UMF rating the better. For treating bacterial infections such as MRSA, I recommend going for a Manuka honey with a UMF of 15 or greater. Can I just use regular honey? Manuka Honey (right) is darker than Clover honey (left). Ensure you use a brand with a UMF of 15 or higher. You can use it…you’ll just be covered in sticky honey that is ineffective against bacterial infections! So…no, you can’t use regular honey and expect positive results. Manuka honey is so effective that “medicinal grade” honey is used in some hospitals to treat MRSA and other bacterial infections. I’m not sure what defines Manuka honey as “medicinal grade” or what UMF rating it has. I can only assume that the grading is determined by the purity of the finished product and that the UMF rating would be 20 or higher as 20 is the highest I have seen a commercial UMF rating go. It can be taken internally obviously but due to the cost I don’t recommend it (although it is absolutely delicious). I personally found it to be most effective when applied topically to the infection site. This could be a boil, a surgical wound, an infected cut or abrasion, or whatever. 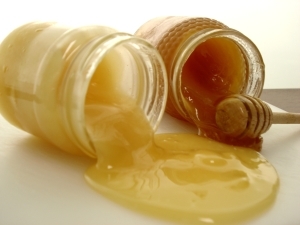 Once applied, cover the wound (and honey) with a suitable wound dressing at let the honey work its magic. You should continue to treat the infection in this fashion well after it “appears” to have cleared up. This will ensure a positive result. Manuka honey is once of Mother Natures little gems! Due to its ability to promote the rapid healing of wounds and its effectiveness against various bacteria (including MRSA), it ranks as one of the best topical treatments for external infections. So…using Manuka honey for MRSA infections could be the best thing you ever do. I hope you found this article helpful? Please feel free to leave a comment below or click here to return to the Boil Bible homepage where you will find our latest posts. I knew certain kinds of honey were better for you than others but I didn’t know they were outright medicinal. My girlfriend is into different types of honey so ill be letting her know about this. She wants to get into keeping bees too. This a great information about honey. I have test many of different types of wild honey because I just love it sweetens but never know what is the real benefit. Great job and thanks for sharing. No problem. Yeah I love Manuka honey because it is not only medicinal but it tastes great. It sure is…. tasty but effective. Glad you liked the post. Wow, what great info, i had no idea that Manuka Honey had so many advantages. Thank You for this info. You are more than welcome. Take care. I have been researching the benefits of Manuka Honey for some time now and my husband went out and bought some. I’ve already began a treatment process on a boil that I have and I can tell its working already. It tastes really good too.